Competition is open to entries of any subject matter within the constraints of the PSA Definition of Travel photography below. ONLINE Entry: The entry method is online which can be found by clicking the http://dvccc-photo.com/circuit/ page. This is the ONLY option for submitting digital images and the ONLY method that accepts online payment. All digital images MUST be in sRGB color space, in JPG format and are limited to a maximum size of 1Mb and 1400 x1050 pixels. Name, identifying marks or words in any language may not be added to any image. Images will be displayed to the judges using Canon Projector with 1400 x 1050 native pixel dimensions. Images by the same maker that were accepted in previous Delaware Valley Circuits, or images that are nearly identical, may not be entered. Entrants should not submit projected images that virtually duplicate each other or differ only slightly. Only one of such images will be judged. Acceptances will be reported to the Photographic Society of America for credits towards Photo Travel Star Ratings, Who’s Who in Photography, and ROPA distinctions. An electronic catalog will be available for free downloading and printing from the website. All entries must include the appropriate forms and fees. Fees are payable in US Dollars by PayPal Any entry received without the required fees will not be processed but will await payment until the closing date. If no fee is received, the entry will not be judged. 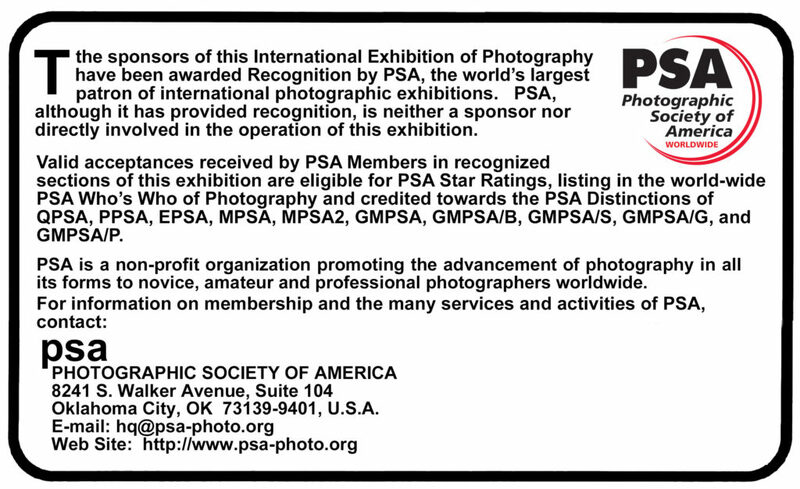 The exhibition will be conducted according to standards and recommended procedures of the Photographic Society of America. PSA members working on Galaxy and Diamond Star Ratings shall be allowed to continue using different titles of monochrome versions and color versions of the same capture that have already been accepted until the required number of acceptances for those titles have been completed. These steps include, but are not limited to, questioning any entrant, requiring the submission of RAW files or other digital files representing the original capture of the submitted image(s), confronting the entrant with evidence that one or more submitted images fails to comply with the Conditions of Entry (also known as Entry Rules), and offering the entrant a reasonable opportunity to provide counter evidence to refute the exhibition organizer’s evidence by a set deadline. Such entries that are not cleared or are still questionable after the entrant has presented evidence may be considered in breach of these Conditions of Entry and declined. Such entries may be referred to PSA for further investigation of possible ethics violations. NOTICE: When an entrant fills in the Entry Form to submit an entry the entrant will see a feature to affirm he or she has read these Conditions of Entry when he or she fills out the entry form. If the entrant does not so affirm the entry will not be submitted.